Quick update on my progress typing with the Dvorak layout (see original post first if you missed it). 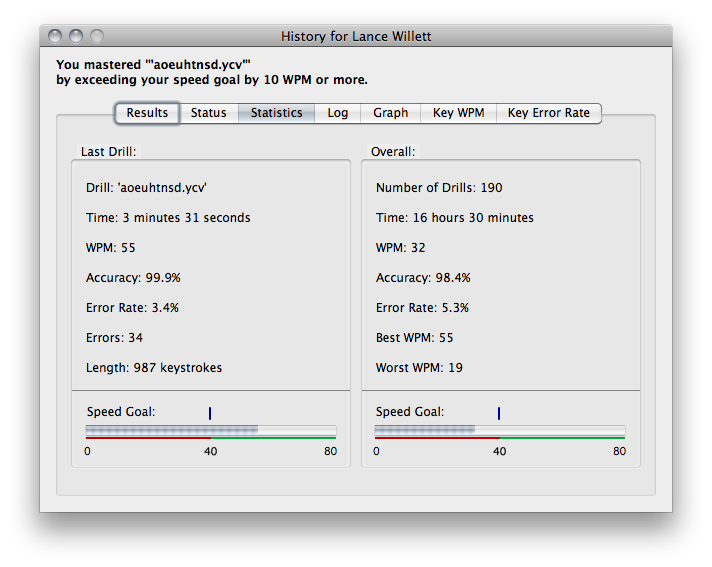 I am now averaging 65 WPM in my drills, though I am a bit slower in real usage. Last week I blanked out my keyboard with stickers to force touch typing using Blank Keyboard Stickers in white from 4keyboard.com on my Mac keyboard. I first considered getting the droolicious Model S Ultimate Silent Keyboard from Das Keyboard, but since it’s a bit pricy I opted instead to use the stickers as a low-cost first step. Today I changed the keyboard settings on my Mac to use “Dvorak” instead of “Dvorak – Qwerty ⌘” to force myself to relearn my keyboard shortcuts. To work smarter and faster at my craft, I took the plunge and switched to the Dvorak Simplified Keyboard. At our Automattic company meetup in September Matt handed out paper copies of The Dvorak Zine, a fun, well-written treatise on why Dvorak is better than the traditional QWERTY keyboard layout. I read it on the plane ride home, played with Dvorak settings on my laptop a bit, and vowed to make the switch during my next extended time off work. Here is the timeline from my switch. 1. September 16th, 2010: Read The Dvorak Zine. 2. November 22nd, 2010: Started practicing with Master Key during a week off from work. 3. December 3rd, 2010: Removed QWERTY from my keyboard settings. 4. December 9th, 2010: Finished Master Key Dvorak drills (set to 40 WPM goal). For fun, here are some stats as of December 9th, 2010 based on my Master Key drill results. My tips and recommendations: Get Master Key, add Dvorak to your keyboard settings, and practice. Then remove QWERTY from your keyboard settings and use Dvorak for everything you type. Pace yourself and be patient. Keep practicing and don’t give up. For more on Dvorak, see Matt’s 2003 classic: On the Dvorak Keyboard Layout. Update December 14, 2010: My goal with learning Dvorak is to get faster and more efficient at typing than I was with QWERTY—with which I type 75 WPM with accuracy. The 40 WPM mentioned in the timeline was during drills used to learn Dvorak; that speed is not the end goal. Update December 28, 2010: This week I passed the Master Key drills again with the speed goal set at 50 WPM. My average speed is approaching 60 WPM. 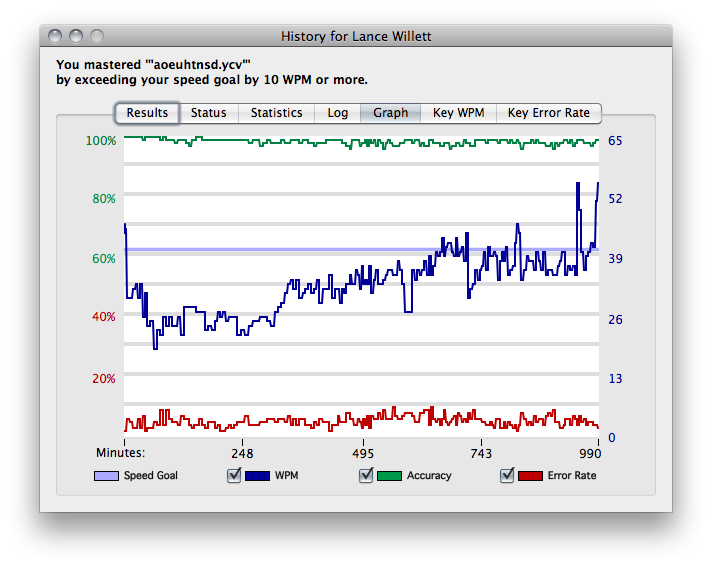 Update January 17, 2011: Now averaging 65 WPM, see notes in Still Learning Dvorak. Update November 22, 2011: An update on my Dvorak learning experience, one year later: Dvorak Redux.